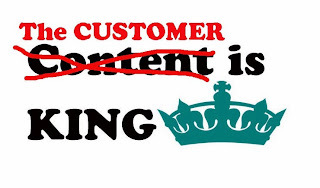 The Rogue Pea Marketing Blog: The customer, NOT CONTENT, is king! It's hard to go anywhere online lately without seeing the phrase 'content is king' thrown about in all kinds of business discussions. It's an expression that has permeated into all corners of the web, and for good reason: businesses are realizing that consumer engagement is key to their sustained growth and existence. Social media has enabled what was once a primarily one-way street for marketing to consumers to become the epitome of two-way communication, and with that came a platform which enabled consumers to talk back to the businesses and corporations that have traditionally been speaking AT them rather than WITH them. While I agree that content is absolutely necessary if you have any sort of online presence and wish to connect with your customers, looking at content like it is the most important piece of the puzzle takes the focus off what really should be the focal point: YOUR CUSTOMERS! Customers must be the key driver for your content strategy. It's the CUSTOMER, NOT CONTENT, THAT IS KING. This goes right back to the central tenet of my marketing training mantra: VALUE MARKETING. VALUE MARKETING is the process of orienting your marketing strategy around what matters to your customers - using their needs, interests, concerns and attitudes to determine what VALUE you can provide to them. This creates a much stronger connection to your existing clients and potential customers, and in turn, forms a much more loyal following. If you'd like to learn more about VALUE MARKETING, and how to improve the quality of your interactions with your customers, contact me for a no-obligation 1-hour review of your current online strategy. PS - Remember to sign up at the right to receive great tips and a discount code for upcoming training sessions and downloads directly to you!